English Version Here: Pavel Vidal & Scott BrownCuba_ and the IFIs, English. 6 Why Join the IFIs? How Can Cuba Gain Membership? 16 Why Should the United States Support Cuba’s Reintegration? What Is the Best Way to Help the Cuban People? The new US policy toward Cuba comes at a critical moment, with its impact reaching far beyond the Florida Straits. Since President Obama’s historic announcement in December 2014, Havana has welcomed the Presidents of France and Turkey, the Foreign Ministers of Japan and the Netherlands, the Director of Diplomacy for the European Union, the Governor of New York, and a host of other policymakers and entrepreneurs from the United States. Pope Francis is scheduled to visit in September. Engagement will be critical to buttressing the government’s appetite for reform. After twenty-five years of post-Soviet adjustment and patchy results from limited reforms, a consensus exists that the economic system and old institutions require a fundamental overhaul. The Cuban gov­ernment is cognizant of the imperative to allow the “nonstate,” or private sector, to grow. It is the only way to slim down the public sector without massive unemployment. 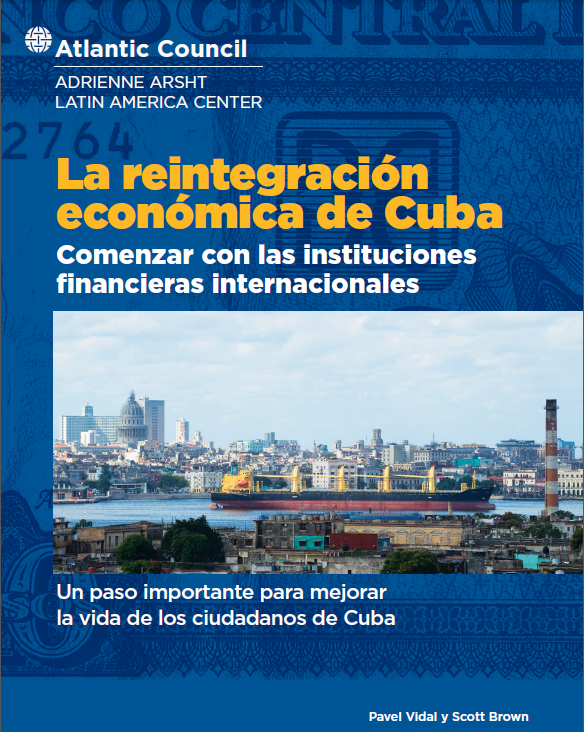 Now that Cuba has caught the eye of foreign investors and the international community, it is a good time to reignite discussion on Cuba’s reinte­gration into the global economy. 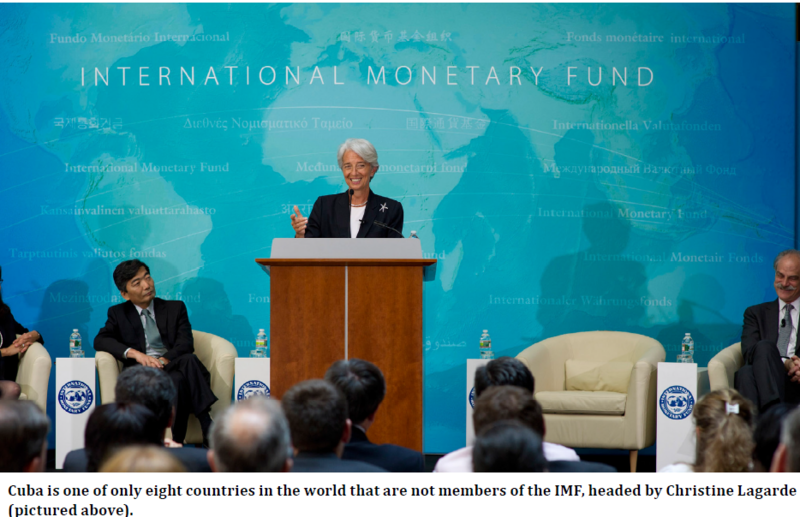 As with so many other countries before, the critical first step will be to regain access to the international financial institutions (IFIs), with a particular focus on the International Monetary Fund (IMF), the World Bank, and the Inter-American Development Bank (IDB). Accession would serve the interests of Cuba and its citizens, the United States, and the inter­national community. In Cuba, the process of economic reform is at a pivotal moment, and more progress is needed to lift the economy on to a new growth trajectory before President Raúl Castro is to step down in 2018. Accession will require adjustments: improving data and transparency, aggressively working to unify the two currencies, and shifting official attitudes. But in the context of the new relationship with the United States, these should not be difficult. The experiences of other former communist countries can provide lessons for Cuba. Albania, which joined the IMF in October 1991, has some interesting parallels. Albania’s first loan from the Fund, under a stand-by arrangement, was approved in August 1992, and its reengagement with the global financial system and policy reforms produced significant improvements in the standard of living. Vietnam offers another posi­tive example, with access to IFI support coming after a period of initial reform. In both countries everything from GDP to life expectancy improved. These universal benefits are compelling factors for Cuba. For the international community, Cuba’s accession is long overdue. Still, in the United States, agreement to Cuban accession could face objections. However, those objections rest on discredited assumptions that sanctions can bring political change and that international support will help only the government and not the people of Cuba. US backing of Cuban membership in the IFIs would be consistent with the new policy of helping to support economic reform. This is a unique opportunity to stimulate further transfor­mations in Cuba. Three possible approaches exist for Cuba to join the IFIs. The first would involve a gradual process of confidence-building between the IFIs and the Cuban authorities, with no initial commitment or date for membership. The second would be a more direct and immediate path, beginning with a Cuban decision to apply for membership. 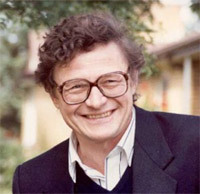 The third would be for President Obama to take the initiative by making a public statement of sup­port for Cuba’s accession to the IFIs, claiming his constitutional prerogative to define the direction of US foreign policy—much like the leadership by President George H. W. Bush in advocating for Russian engagement and membership in the IMF in 1991-1992. 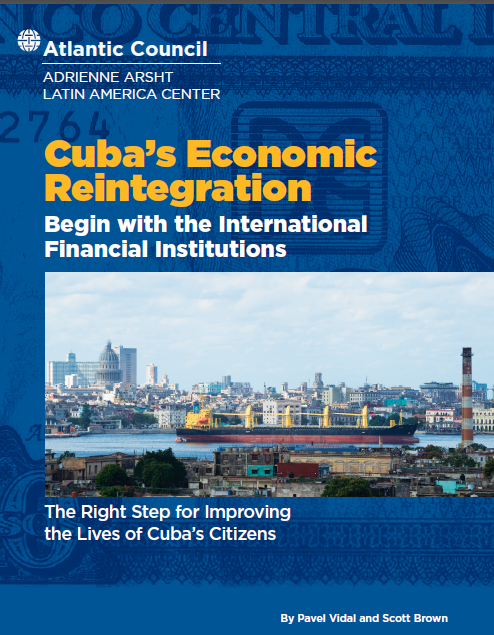 This report argues that a series of steps can be taken now—by Cuba, the United States, and the international community—to pave the way for Cuba to be welcomed back as a full and active member of the international financial institutions. CAF-Development Bank of Latin America plans a small overture toward Cuba later this month that could be a stepping stone toward the island rejoining the international financial community. CAF — whose members include 17 Latin American and Caribbean countries, Spain and Portugal and 14 private banks in the region — is planning a conference with the University of Havana to explore economic development in Latin America and Cuba. While the April 28-29 conference is an “intellectual” rapprochement, Enrique García, the executive president of CAF, said that while in Havana, he also plans to explore the possibility of Cuba becoming a member of the only multilateral bank owned by emerging nations. Unlike other regional financial institutions such as the InterAmerican Development Bank, membership in CAF doesn’t require that a member country also belong to the Organization of American States. Although Cuba was one of the founding members of the OAS, it was suspended for nearly five decades after the organization found Cuba’s Marxist-Leninist government incompatible with OAS principles. The OAS lifted that suspension in 2009 on the condition that Cuba take part in a “process of dialogue” on OAS principles. But that dialogue never took place and so far Cuba has said no thanks. For decades, Cuban officials criticized the OAS as a tool of the U.S. government and said the organization would “end up in the garbage dump of history.” But that was before the United States and Cuba began the process of renewing diplomatic relations. “My feeling, however, is that Cuba will not return yet to the OAS,” said José Miguel Insulza, secretary general of the OAS. “It’s going to wait for some time. I think the issue of the U.S. continues to be very relevant for them. They want to have normal relations with the U.S. first. Things are percolating on other fronts too as Cuba tries to shore up its troubled finances and rejoin the global economy. In early March, for example, Paris Club Chairman Bruno Bezard met with Cuban finance officials in Havana. Cuba stopped servicing its debt with the Paris Club, a grouping of 20 industrialized nations, in 1987. The two sides began talking about a year ago after previous Paris Club negotiations in 2000 broke down. “We have moved very quickly. There is plenty of will on the Cuban side and the side of the creditors to begin this work,” Bezard said at a news conference in Havana. During the talks, how much debt and interest are owed to each Paris Club creditor was discussed. France is currently the largest of 15 Cuba creditors. Bezard, also director general of the French treasury, recently told AFP that in a matter of months, debt negotiations with Cuba might begin over the approximately $15 billion it owes Paris Club members. In recent years Russia, Japan, China and Mexico have forgiven a portion of Cuba’s debt and given Havana more manageable repayment terms. Cuba’s admission to other international financial institutions such as the World Bank and the International Monetary Fund, however, is much more problematic. Not only does the Helms-Burton Act require the United States to oppose Cuban admission to such international institutions but it also requires the United States to reduce its funding to them if Cuba is admitted over U.S. objections. But the United States isn’t a CAF member. García said if Cuba were to join the development bank, the goal “at this stage” would be to provide technical assistance to Cuba rather than loans. 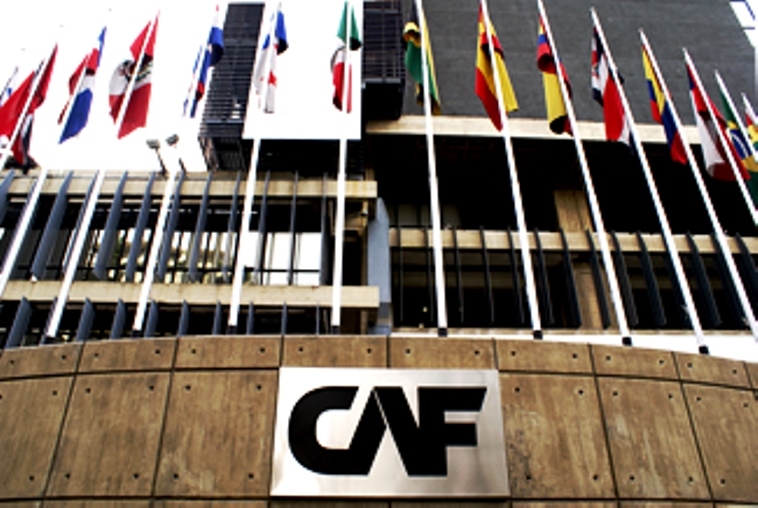 In CAF’s 45-year history, García pointed out, it has never had a default. If Cuba were interested, CAF might, for example, provide technical support as Cuba tries to unify its dual currency system, he said. Now the focus is on the international seminar, “Opportunities and Challenges for Economic Development in Latin America and Cuba,” that will bring about 150 people together later this month. Among those who have been invited are Enrique Iglesias. former president of the Inter-American Development Bank, and Alicia Bárcena, executive secretary of the Economic Commission for Latin America and the Caribbean.